Toronto had several elephant deaths prior to this decision and by May of 2011 and facilities upgrades were badly needed. Further the AZA had laid out new guidelines for its accredited facilities on the keeping of elephants. All of this meant more money. In 2009 it appeared as if the zoo board was prepared to make these changes but by 2010 and John Tracogna’s arrival this plan had changed. What remained of the zoo’s herd were three healthy and spectacular female African elephants, Iringa (44) and Toka (43) who have lived at our zoo since they were young calves and Thika (32) who was born here. After the decision in 2011 to phase out the exhibit the zoo undertook a due diligence process to review 7 AZA facilities which had offered to re-home our elephants. By the fall of 2011 they had completed their review and had chosen a plan and a home. The girls were to be relocated to Disney’s Animal Kingdom in Florida and integrated into a multi generational family herd. This herd would be the first herd eventually relocated to the now newly completed National Elephant Centre in Fellesmere, Florida. At the time of the decision TNEC had not even broken ground. The zoo board had ruled out one sanctuary located in Tennessee due to a tuberculosis outbreak which had occurred in 2009. They had also ruled out west coast facilities due to the long transport distances and the logistics involved, not the least of which was that moving three elephants not accustomed to transport period let alone a 4.5 day road trip was inhumane and unnecessary considering there are other excellent viable facilities much closer. It is not surprising that the pending announcement was somehow leaked to Zoocheck Canada and City Councillor Michelle Berardinetti. A City Councillor named Glenn DeBaeremaeker is also a zoo board member who has worked closely with Zoocheck and their affiliates for years. 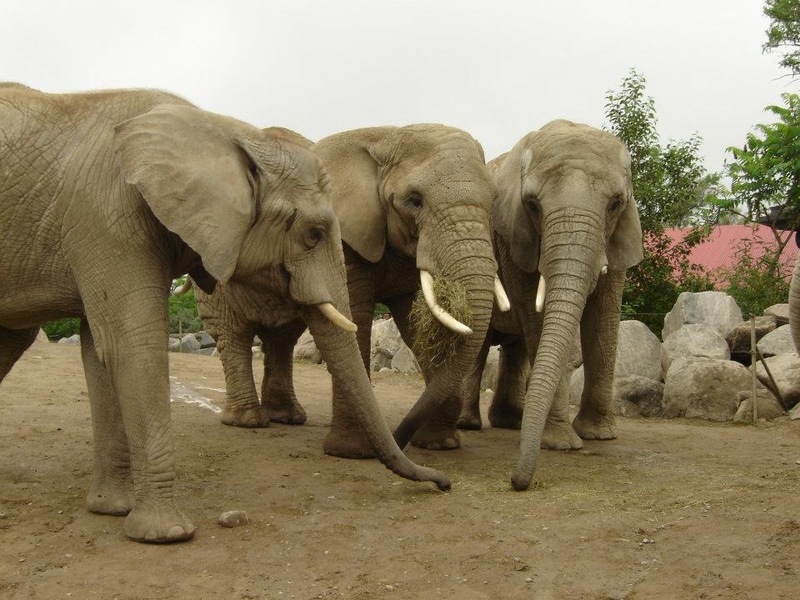 Councillor Berardinetti, a self proclaimed animal rights activist worked with Councillor DeBaeremaeker, Councillor/zoo board member Raymond Cho and Zoocheck’s Julie Woodyer to write a motion for council demanding the city send our elephants to PAWS. In fact Julie Woodyer wrote the motion verbatim which was carried in favour of PAWS. The Toronto Zoo is owned by the City of Toronto. Several councillors and some of whom are zoo board members had been colluding with PAWS sanctuary (possibly since 2009) and just prior to the zoo’s announcement they seized control of the elephants with Zoocheck’s motion claiming the elephants as city assets. In a motion without notice (the motion written by Zoocheck) on October 24, 2011 without any site visit or due diligence they overrode the zoo’s professional expertise and authority and chose PAWS as the new home for our elephants. Other than the CEO no zoo vets or senior zoo staff members were at the meeting. Although this is in contravention of Ontario Animal Welfare Laws and regulations to make that decision without a site visit or completed due diligence, the zoo is registered as a research facility in Ontario and exempt from the laws guiding the PAW (Provincial Animal Welfare laws). Councillor Berardinetti and Councillor Raymond Cho did a personal site visit on November 8-10, 2011, the zoo staff went December, 2011. Councillor Berardinetti claimed her trip was a family trip not an official site visit (she has no academic or professional authority to assess PAWS’ viability as a potential home) despite evidence in FOIA indicating that her trip was possibly funded by Zoocheck and PAWS (see here). We are to assume I guess that Councillor Berardinetti often takes family trips with Councillor Cho. The zoo’s site visit report which was not entirely favourable was never brought to the board or council or made public BUT you can review it here accessed via FOIA. Zoocheck kept pounding home in the media that the zoo was just doing the AZA’s bidding and not concerned with the actual welfare of the animals in question. The decision by council was challenged immediately by zoo staff, citizens and experts from around the globe on the grounds of bio security issues and tuberculosis as well as the long distance for transport. It was outlined in this blog post from the most comprehensive captive elephant database on the internet. It was discussed at Zoo News Digest. This blog site posted the first USDA documents back in April of 2012 which finally proved there had been a tuberculosis crisis at PAWS. Meanwhile Zoocheck and Councillors consistently and adamantly refuted any claims of Tuberculosis on site, claiming PAWS had never had a disease issue, that PAWS did not have TB, (news articles). They made this claim again and again in the media while attacking the zoo and its staff accusing them of pushing a “red herring” despite expert testimony to the contrary from Dr. Dale Smith, a zoological disease specialist and pathologist from the University of Guelph’s Ontario Veterinary College. Councillors and Zoocheck continued to accuse zoo staff of caring only for their jobs and not for the welfare of the elephants. Meanwhile PAWS, Zoocheck and Zoocheck’s USA counterpart Born Free USA gathered their petition signing troops; the thousands of zealots who will sign anything their spiritual leaders tell them to without question. The media gave Zoocheck and these Councillors’ endless opportunities to spew their ideology and lies in the press while zoo staff was heavily censored by council with new social media policies and threats of job loss. This is still the current the strategy to keep the truth at bay with CEO John Tracogna doing Councillors bidding without question and without any support for the zoo and its staff. Council’s reasoning against TNEC (supplied to them by Zoocheck in fine print here ) is that they would use elephant hooks despite the use of this tool being limited to calving/birthing and that our elephants are protected contact and would never see an elephant hook. 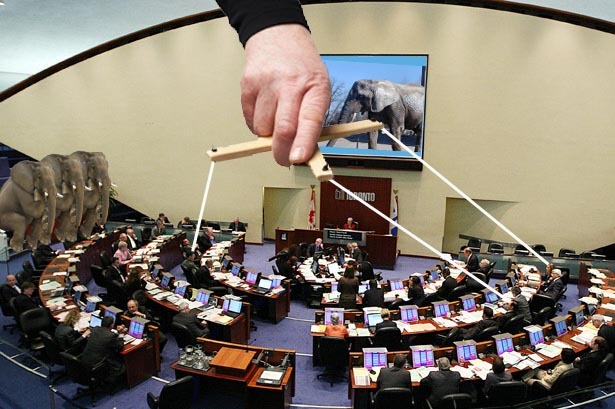 Councillor DeBaeremaeker brought in an Asian styled ankus not an elephant hook as is used in North American elephant management as an example and waved it around council to push the point home comparing it to a crowbar. It was pure ideology driven decision making, propaganda and nothing more. Not only did the zoo claim they would choose no facility which used elephant hooks but they also claimed that they would not choose any facility on the west coast due to the logistics for transport nor would they choose any facility with past or current issues with tuberculosis. City politicians have been willing to bypass the TB and transport issues to cater to their will and anti-zoo beliefs but they will not budge on the limited use of the elephant hook at TNEC. This is because in the end their aversion to TNEC is not because of an elephant hook it is simply because it will breed elephants for the AZA and our council is against either zoos or at least elephants in zoos, they have bought into animal rights propaganda without doing any actual research of their own. They have relied solely on the information which was being provided to them by anti zoo organization Zoocheck Canada, none of them ever contacted TNEC or the AZA for clarification. The AZA has claimed that they will be phasing out the use of an elephant hook by 2014. Zoocheck knew they could play on the heartstrings of the unsuspecting uninformed public with elephant hook propaganda. If you know anything about politics in the city of Toronto you will know that our current municipal “leaders” are self proclaimed legislators of the future, and they legislate according to a future where they think higher intellect will see zoos as archaic, unnecessary prisons with little or no value to the education or conservation of species and their wild habitats. From my personal experience I have never considered the extremist anti zoo movement to be of a higher intellect. Our Zoo board chair Joe Torzsok, our CEO John Tracogna and city councillor/zoo board members have done everything in their power to cripple our zoo and its efforts to share with the public their concerns about TB at PAWS. Oppressive social media polices were put in place, gag orders placed on senior vets and staff. Shut up or lose your job sums it up nicely. The AZA pulled the Toronto Zoo’s accreditation citing issues with our governance. The AZA came to the zoo board meeting, on USA Thanksgiving in 2011, and was received poorly. EMA and CAZA came as well, they received the same reception. Zoocheck kindly offered to spoonfeed City Councillors with statements for the media denouncing AZA accreditation as less than the standard of PAWS and that the loss of our accreditation was a bullying tactic by the AZA (pg3) to force a re-decision on PAWS as a home for the girls. You see because of Zoocheck’s media maipulation this was now about zoos vs sanctuaries and the zoo and its supporters were driving this battle in the name of the AZA and not because we were and still are concerned about tuberculosis at PAWS. The pro-PAWS coalition did everything they could to deflect from the seriousness of TB on site. Here in PAWS own newsletters from 2012 you can read where they disparage the Toronto Zoo and the AZA (in breach of contractual agreements). Of course these are the same people, Zoocheck and Councillors, who misled the media accusing zoo staff of being motivated by fear of job loss, see here and here – knowing full well that no staff would be losing their jobs. In January of 2012 a bull elephant named Sabu died at PAWS. As a result of Sabu’s death a citizen led group called Zoos Matter began what has become an almost 2 year battle. He had only been there for 18 months and he was just 29 years old. Sabu was one of two elephants and $270,000.00 which PAWS agreed to take as a result of a legal settlement with Ringling Brothers/Feld Entertainment. Red flags were raised. It took less than a week to hunt down supporting evidence that Sabu likely died from TB. His previous caregivers stated publicly that Sabu showed no signs of lameness or illness when he left their facility to travel to PAWS. In an email between Zoocheck’s Julie Woodyer and Councillor DeBaeremaeker Zoocheck claims PAWS had no idea Sabu had TB, and that his previous caregivers, Two Tails Ranch had not told them. Of course anyone who has researched this would know full well that Sabu’s previous positive diagnosis for TB 10 years earlier is widely available on the internet from USDA documents posted by PETA in their media file series on circuses. By April of 2012 FOIA indicated that in fact Sabu did die TB+, but prior to that in February Zoos Matter was able to provide enough evidence so that the Zoo Board and CEO at the very least were required to allow the zoo vets to investigate this death and other possible TB deaths at PAWS. Despite these concerns in February of 2012 the zoo and the zoo board went ahead and signed a legal agreement with PAWS. PAWS claimed that Sabu died of severe genetic arthritis and the tissue cultures would take up to 8 weeks. They never willingly shared the tissue culture results; these were accessed via Freedom of Information. Even after the FOIA evidence which surfaced in April of 2012 indicated he died TB+ and with not one but two strains of TB they still claim he died “from euthanasia due to degenerative bone disease”. Evidence indicates that PAWS knew for some time that Sabu was actively infected again. In a blog post dated July 13, 2011 by a visiting sanctuary owner Karl Cullen he discusses how Sabu was under full quarantine and that he and staff had to wear protective masks and gloves. They knew full well Sabu was TB+ was early as the summer of 2011. This was months before council seized control of the Toronto Zoo elephants and made the decision to send them to PAWS promising that THERE WAS NO TUBERCULOSIS AT PAWS. PAWS claim that Sabu had died from severe arthritis was basically a lie or at the very least not the whole truth. Advanced severe arthritis was obviously a symptom aggravated by his positive tuberculosis infection. When the FOIA was finally accessed in April of 2012 it was proven conclusively that Sabu died TB+. No media outlet called Zoocheck or the Councillors or PAWS out on why they had publicly maintained for so long there had been no TB at PAWS when it was clear and evident they had known for months that he was ill with the disease. That same FOIA indicated that another Asian elephant named Rebecca had died in January of 2011 TB+, again with not one but 2 strains of TB. Her second strain of TB was new to elephants and had no match in the global tuberculosis databases as per a search done by the CDC. By their own admission in the graphs included with the Dr. Cork report and in FOIA PAWS and their Vet Dr. Gai admit Rebecca’s treatments were ceased three years prior to her death (here pg. Pg.25/pg.2 of necropsy report) To date no investigations have determined where this second strain of tuberculosis came from. Through freedom of information requests and research we were able to prove that PAWS actually had a tuberculosis outbreak with TB transmission on site which included 3 elephants (3 that have been documented), the transmission was entirely their fault due to bio security protocol failure as they had no idea the source elephant was TB+ until after her death. They and their affiliates on council along with Zoocheck Canada who acts as PAWS agents here in Toronto lied outright to the media. Zoos Matter did the job City Council failed to do. This pro-PAWS coalition also engaged in a media campaign to disparage and malign the zoo and its staff to undermine staff motives for opposition, basically to turn people against the zoo and deflect the media from the real issue at hand, tuberculosis. The media willingly complied. Staff have been harassed and stalked on social media by activists who file complaints to the city and CEO if any staff say anything about this transfer publicly. Senior vet staff have also been threatened with job loss if they continue to fight, research or refuse to sign off on anything PAWS related. City Councillor Glen DeBaeremaeker even went so far as to encourage the senior vet staff at the zoo to resign if they felt they were being forced to engage in unethical activities. He said he would resign if it were him, we wonder why he has yet to resign considering the lack of ethics of forcing three healthy animals to a facility with a known disease outbreak simply to satisfy personal extremist dogma. Meanwhile while Zoocheck and Councillors had the media focusing on staff issues they were misleading everyone about tuberculosis at the sanctuary, sort of like how a magician says look closely at this hand while I trick you with the other hand. Now that tuberculosis had been proven on site Zoocheck, PAWS and Councillors began claiming that the African herd was safe from TB, that the STATPAK tests and trunk washes for the LIVING elephants were clear. They were very careful to use the word “living”. Councillors, Zoocheck and PAWS were quick to state that although they previously hailed the STATPAK test as the gold standard in diagnoses of TB and that they were leaders amongst facilities with elephants using that diagnostic they quickly changed their tune when FOIA indicated positive Statpak reactions in Rebecca’s herd mates, they flip flopped and stated trunk washes were gold standard. Trunk wash is of course an unreliable test and this can be evidenced here and here (elephantcare.org), citing a case in Sweden and a TB outbreak where five elephants were affected. Of 189 trunk wash samples collected, only 7 were positive from the 5 elephants that were confirmed (on post mortem) to be infected with TB (Moller 2005, Moller 2006, Lewerin 2005). What is Gold Standard is a tissue culture, as we know trunk wash is only good if a) the sample is not contaminated with foreign substances and b) the animal in question is actually shedding the organism when the trunk wash is conducted (elephants shed the TB bacilli intermittently so it is hit and miss with more miss than hit). Furthermore it had been evidenced in the TB case of Rebecca that an infected animal can show a negative STATPAK result or the results can be misinterpreted for animals previously infected or treated and that trunk wash tests failed to diagnose TB at PAWS, claiming the African herd is clean means nothing based on the failed diagnostic history of their Asian herd. On an airing of the television program The Agenda Councillor Berardinetti admits she knew about the tuberculosis. Here is a link from the Live Chat file from TVO’s The Agenda with arguments and commentary by Zoocheck Canada’s Julie Woodyer, PAWS supporters vs Toronto Zoo supporters, well worth the read. I can tell you that commentators on behalf of the zoo were Zoos Matter team members and not zoo staff as Ms. Woodyer would have everyone believe. When FOIA documents finally evidenced that in fact there was tuberculosis on site and that there had been on-site transmission PAWS, Zoocheck and Councillors began their media campaign claiming that the elephants in question had been in quarantine and that all proper procedures had been followed. In a presentation to the Toronto Executive Committee Meeting in November, 2012 Annie’s likely positive TB status and quarantine issues were brought forward by a deputant as well as evidence of the Africans and Asians sharing one barn and how it was logistically impossible to quarantine any of the elephants based on the availability of barn space. We had reviewed multiple videos, photographs, blogs and news stories, scoured our FOIA- we left no stone unturned. They claimed the two affected Asians were in quarantine at a time when Sabu was still alive, we asked the question where? There was no available barn until Sabu’s death in January of 2013. With one barn for the Africans females, one for the Asians and the three bull barns all occupied until Sabu’s death they were simply out of barns. According to the Zoos Site Visit report there is no quarantine barn at Ark2000. According to that same report the zoo vets and staff were only allowed to inspect two out of the five barns on site. Now that Annie is TB+ we imagine she is living alone, likely in one of the bull barns. You know, alone, a lone elephant like the kind of elephant Zoocheck promotes is being treated inhumanely in zoos because they are sad and isolated. In fact according to The Dr. Cork report despite be diagnosed as TB+ in June of 2012 Annie had still not been begun treatments by November 27, 2012, six months after her positive diagnosis. So not only was she living alone but potentially dying from tuberculosis as well. We made this public and not one activist organization had any problem with it. I imagine if a zoo did not treat an animal for 6 months? Zoocheck would be outraged. People were certainly outraged when this recently happened in France. This news article mentions the one barn and quarantine of Tinkerbelle. Ruby did not have a proper quarantine, just 10 days after her arrival she was introduced to the African herd, she was able to touch the other Africans in the barn as soon as she arrived at Ark2000. Evidence of the shared barn can be found here and here. Eventually zoo staff were denied second site visit by Pat Derby. Considering they had no idea Rebecca was TB+ when she died and wore no protective gear and that Rebecca infected 2 other elephants (one of which is now TB+) and they had no physical means to quarantine while Sabu was still alive (all 5 barns were being used) our concerns over bio security at PAWS grew with every passing day. It was in fact much more serious than we had possibly imagined. An extensive research project was underway to investigate the detailed histories of each elephant at PAWS. We focused on a particular African elephant named Ruby who had died three months after Rebecca with no cause of death determined and who had a high risk history of TB exposure. At the same time the zoo vet staff were demanding medical histories on the Africans and PAWS was not cooperating with these requests as evidenced in the Zoos Transfer status update on September 25, 2012. It was at this time PAWS and Zoocheck made some very public media statements accusing the zoo staff of undertaking unnecessary delays – unnecessary delays? Asking for tissue cultures from a deceased African elephant to determine its disease status at time of death is not unnecessary it is what any zoological professional should expect and demand. Not having tissue cultures done for Ruby was the epitome of unprofessional and there is no reasonable explanation as to why the cultures were not done. To date there has been no mention in the media about the missing cultures which are crucial to determine the disease status of the African herd at PAWS. Councillors made numerous claims that our zoo was motivated by pressure from the AZA not animal welfare, remember the zoo lost its accreditation due to governance issues. Basically the AZA felt our zoo had no control over the future and welfare of its animals and the AZA was correct. Under the guidance of CEO John Tracogna and Zoo Board Chair Joe Torzsok, pressured by City Council/Councillors/Zoo Board members we had now lost our AZA accreditation with the potential loss of CAZA and our government research facility accreditation looming. Councillors continued to make many claims in the media disparaging our zoo and its staff. Evidence via FOIA indicated these councillors again were being spoon fed statements by Zoochecks Julie Woodyer. According to PAWS and Zoocheck the vet for PAWS at the time of Ruby’s death was the vet they were parading around as an expert, Dr. Mel Richardson. The same vet who at the November 2012 City of Toronto Executive Committee Meeting had no idea how many elephants had died at PAWS under his supposed watch. That would be 6, in four years. It is pretty hard to not remember that 6 elephants died while under your “expert” veterinary care. In fact all the PAWS supporters and deputants at that meeting were asked the same question; none of them knew the answer. Dr. Richardson has been involved in cases where he has made ocular inspections of an animal like Mali, the elephant in Manila Zoo (here) only to be disproven by an IUCN expert who had access to Mali’s blood sample. Dr. Richardson is a paid advocate for animal rights groups in the USA and far from impartial. At the November 27, 2012 City Council meeting to re-vote on this issue no public or citizen deputations were allowed however they allowed a video-taped deputation from Dr. Richardson. The zoo rightfully requested the tissue cultures on Ruby, PAWS stated they had no more medical documents to give. According to Zoo staff PAWS was uncooperative throughout the entire due diligence process as stated in the Zoo’s Elephant Transfer update press conference on September 25, 2012. As a result of this press conference PAWS sent a legal letter to the Toronto Zoo Board in October, 2012. PAWS considered the statements of the zoo at this meeting to be defamatory, indicated in City of Toronto FOIA email from Julie Woodyer. FOIA requests to USDA, California Fish and Game and California Health Department came up empty, proving that no tissue cultures were ever done on Ruby. Clearly if tissue cultures were done and TB was found and officially documented in their African herd PAWs would not currently be in receipt of the Toronto zoo elephants, they would not have been considered in the first place and likely would have been restricted by their local and federal agencies from integrating any new elephants into what is basically their financial life blood, their African herd at PAWS. Both their Asian and African herds would be considered high risk for tuberculosis. They would have no means to accept any new elephants of any species. FOIA indicated that PAWS had a human case of sero conversion to tuberculosis (here pg.12). Zoos Matter followed up and accessed the genotypes (and here) for the two current cases of human tuberculosis (as of January 2013) in PAWS’s Calaveras County. Those genotypes did not match any of the documented TB strains of any PAWS elephant but they did match an elephant named Calle. We followed the elephant trail and easily connected Calle’s strain of TB to the African herd and to PAWS through two Asian elephants, Calle (deceased from tuberculosis) and Tinkerbelle (deceased complications from chronic foot infections). Ruby had lived with an Asian elephant named Gita at the LA Zoo. After Gita died in June of 2006 Ruby was transferred to PAWS in May of 2007 where she lived in a shared barn with both the Asians and Africans until late 2009, all the female elephants shared this one barn since 2004. Detailed reviews of dated photographs, videos and news articles and in PAWS and Pat Derby’s own words (and here) evidence this. LA Zoo had a TB outbreak from 1997-2000. Before living with Ruby Gita lived 2 other Asians, Annie (not PAWS Annie who is now TB+) and Calle. Both Annie and Calle died from tuberculosis. Annie died on March 22, 1997 from tuberculosis at the LA Zoo, Calle was transferred to San Francisco Zoo where she lived with an Asian named Tinkerbelle. Tinkerbelle was transferred to PAWS in November 28, 2004 and died just 4 months later from severe foot infections Calle died March 6, 2004 of tuberculosis at San Francisco Zoo in 2004. Pat Derby can be seen here handling Tinkerbelle without proper protective gear. One has to wonder with such compromised health issues why activists demanded that Tinkerbelle be transferred in the first place and not humanely euthanized at the zoo. One can only imagine that perhaps PAWS’s arrogance drove them to believe they could magically heal her. Nevertheless there are no tissue cultures for Tinkerbelle either. One other elephant came from the San Francisco Zoo, an African named Lulu who currently lives in the PAWS African herd. Of the three remaining Africans at PAWS two are in the same age range as Toronto’s Thika. PAWS has claimed that our elephants will be their last. At some point that African herd will be down to 2 then 1, living a life of solitude. At the National Elephant Center there will always be family groups of elephants, they will never be alone or die alone. Without Ruby’s tissue cultures PAWS cannot prove there is no Tuberculosis in the African herd. Statpak tests have proven to be useless when animals have already been exposed to or infected with TB (evidenced in Rebecca’s case) and trunk washes are notoriously unreliable. This is all evidenced by PAWS own experiences as all trunk washes for Rebecca, Annie and Wanda were negative (pg.26-27) even up until Rebecca’s death from tuberculosis. According to the Dr. Cork report and the information supplied to them by PAWS, the sanctuary has NEVER had a positive trunk wash result? How exactly did they diagnose Sabu? Somehow Rebecca’s STATPAK test was misdiagnosed as she would have had some kind of reaction due to her past history of exposure and treatment. Her STATPAK tests would have presented with positive reactions which must have been misinterpreted as residual from her previous diagnosis for TB back in 2002 (she was treated at PAWS). One has to wonder if Ruby’s Statpak tests, due to treatment and exposure would have shown some kind of reaction that was also misdiagnosed. Imagine their panic when upon necropsy of Ruby they found a bronchial mass. Not having this cultured was irresponsible elephant management practise and evidence of reckless bio security FAILURE. There can only be one explanation as to why cultures were not done and I will leave that up to you to evaluate. The evidence of risks of tuberculosis within the African herd at PAWS is near conclusive. It can only be “near” as there are crucial missing pieces of medical information which would determine once and for all if the herd had been exposed; tissue cultures for both Ruby and 71. 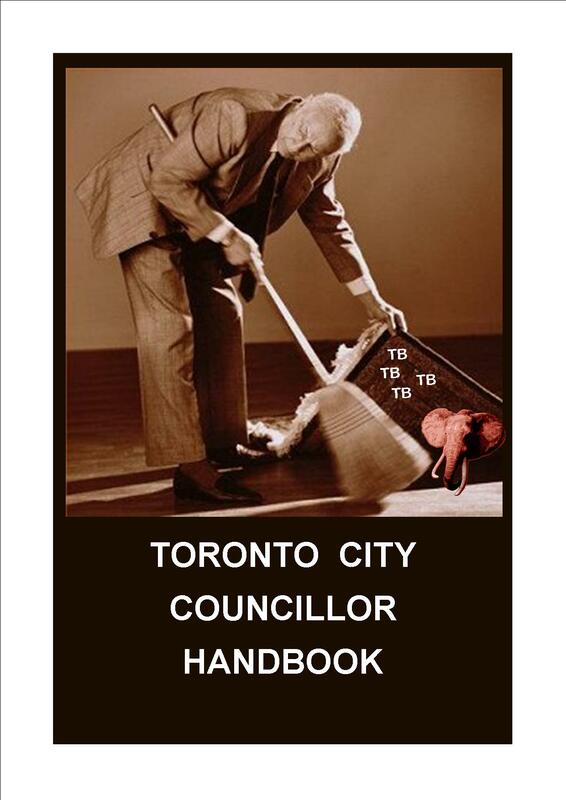 Toronto City Council refuses to listen to anything which might challenge their egos and dogma and our CEO is pandering to council to save his 200k a year job despite having the legal right according to the contract to say no on the grounds of tuberculosis. (Item 17). The entire senior professional staff at the Toronto Zoo is against this transfer and their professional authority has been overridden by politicians and animal rights groups. By October 2012 there were threats of legal action against the Toronto Zoo and a Swedish blogger and keeper/creator of the internet’s most comprehensive database on captive elephants worldwide had also been threatened with legal action by PAWS. On November 5, 2012 by order of the Toronto Executive Committee council was to re-vote on this issue. You can review some of the recorded deputations from the meeting here. 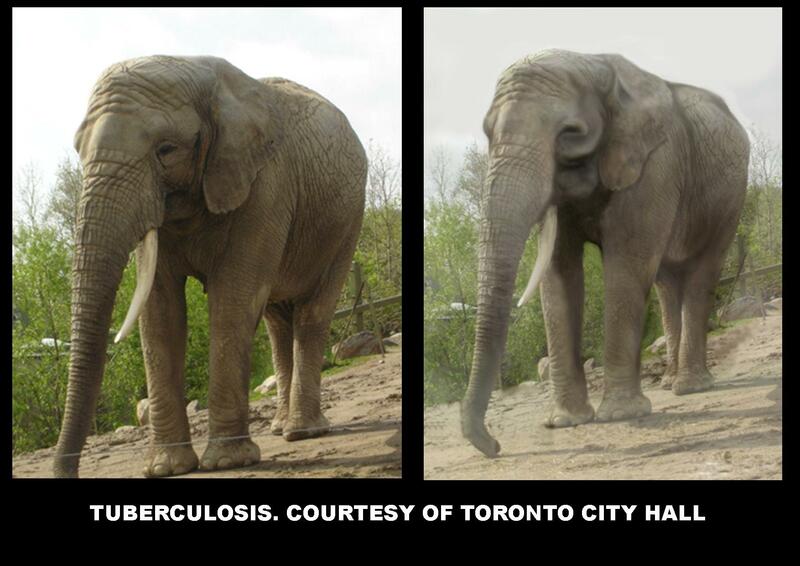 You would think with the overwhelming evidence of tuberculosis transmission on site and the attempts to cover this up and keep it from the zoo and the people of Toronto that council would have had the good sense to re-evaluate their earlier decision. Instead Toronto Council adopted what they claim was an independent report which stated PAWS’s bio security was in good stead, The Dr. Cork report. We have evidence that this report was commissioned by and paid for by Zoocheck Canada (here and here and here pg.7) and that Dr. Cork based her report entirely on information supplied to her by PAWS. FOIA evidences that Zoocheck requested the report on behalf of the City of Toronto yet no record exists of any official or unofficial request of this nature from the City or Councillors, just the email request from Zoocheck’s Julie Woodyer. Council chose this report over the Toronto Zoo staff’s due diligence report (supporting DD documents here) so that they could move forward with the move to PAWS despite the overwhelming evidence of tuberculosis risks. By doing so Council could claim the due diligence was complete and then Zoocheck could lobby the Royal Canadian Air force for a plane and at the same time apply for road transport permits in case RCAF refused. The significance of the Dr. Cork report. The Health of Animals Act states that no person should conceal the existence of disease . There are instances where PAWS refused to comply with requests for more information (tissue cultures) and the failure to allow the Toronto Zoo vets access to the quarantined barns (here) as concealment of disease. We also have evidence of Councillors misleading the public in the media about tuberculosis at PAWS and going so far as to claim there was no TB at PAWs at a time when FOIA indicates there was. From the get go it was stated by council and the zoo board that relocation to PAWS would require air transport, that air transport was the most humane mode of transport for such a long transport distance, 4200km give or take a few hundred for detours. It was never etched in stone, city motions and rulings do not say air transport only but it was verbally stated by Councillors and the Zoo staff, the Zoo Board and quoted in the media, city council meetings and in FOIA correspondence. Zoocheck and PAWS won public favour by having Bob Barker, to much media fanfare promise $800,000.00 to fly the elephants. For 18 months this is what they said. The first plane was an Antonov-124 Russian cargo plane with a low pressure cargo hold which would have broken international aviation laws and would have been a medical health risk to the elephants. We challenged this on social media and at City Hall as unsafe and dangerous. Regardless of the concerns Councillors and Zoocheck pushed for the transport in this plane and to top it off they pushed for it in the month of August of 2012, the hottest month of the year. We successfully fought this and won but PAWS with their seemingly infinite bank account put out a press release claiming they had decided to delay the transport on those dates due to the heat and inherent risks, you can read their claims here (Toronto Star) and here (CBC News). The press release appeared as a news article and went viral. 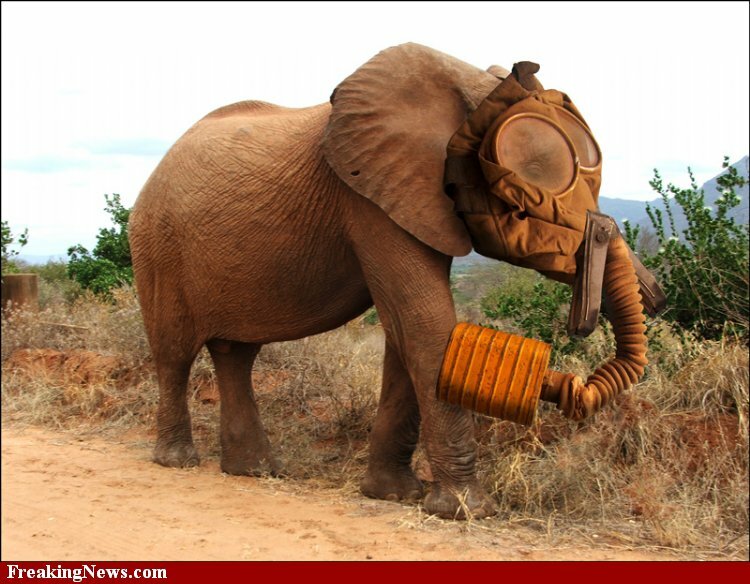 But recent FOIA indicates that they were fully prepared to transfer the elephants in that plane during that month. Councillor Cho made several failed attempts to bring a Motion without Notice on this issue to force the August transport date at a July, 2012 Council Meeting. That transfer date accommodated the plane’s schedule in North America and in Zoocheck’s own words would save Bob Barker a few hundred thousand dollars. Better off dead than captive bred, even if it means killing these elephants in an effort to get them to what activists claim is “freedom”. Tuberculosis is not freedom, dying en route to a sanctuary is not freedom. Being sacrificed in the name of a cause is not freedom, it is exploitation. Do not be fooled by well crafted expensive press releases, it was not PAWS, Zoocheck Bob Barker or the pro-PAWS City Councillors who stopped that August transport. It was lobbied hard by citizens and by zoo supporters. Zoocheck and PAWS were more than willing to follow through with transport in August of 2012 but it was stopped. They were more than willing to transport the elephants in this unsuitable aircraft during the hottest month of the year and now we are to consider and value their “expertise” on their mode of transport changes and a 4200km non-stop road trip? Now it is August of 2013. Almost 2 years later. Many on council are driven by their refusal to pay the transport costs and their decisions have nothing to do with what is best for our elephants. Others are driven at this point by ego refusing to admit they made a mistake, and the driving force behind support for PAWS is extremist anti-zoo ideology and money. Imagine the momentum for large animal rights organizations when they can hail this as a victory over the AZA, a victory against zoos. Keep in mind the Toronto Zoo elephants have limited travel experience, only once for the older ones in their youth and Thika has never travelled. They are protect contact elephants, once they are on those crates they are stuck there for 4200km. All feeding, watering, feces removal and vet care must be done through the crate openings. In case of an emergency only a crane can remove the crates and once crates are removed as protected contact elephants they need to be offloaded at a zoological facility equipped to manage the girls and provide space for them. You cannot predetermine the timing of a medical emergency, and if one of these elephants has a medical emergency the odds while driving across the Midwest of being close to a facility which meets these criteria are pretty slim. (map). Active Environments are not a transport company, they are a training and management company who have been given control over a transport plan of three elephants unlike anything they have ever undertaken before. 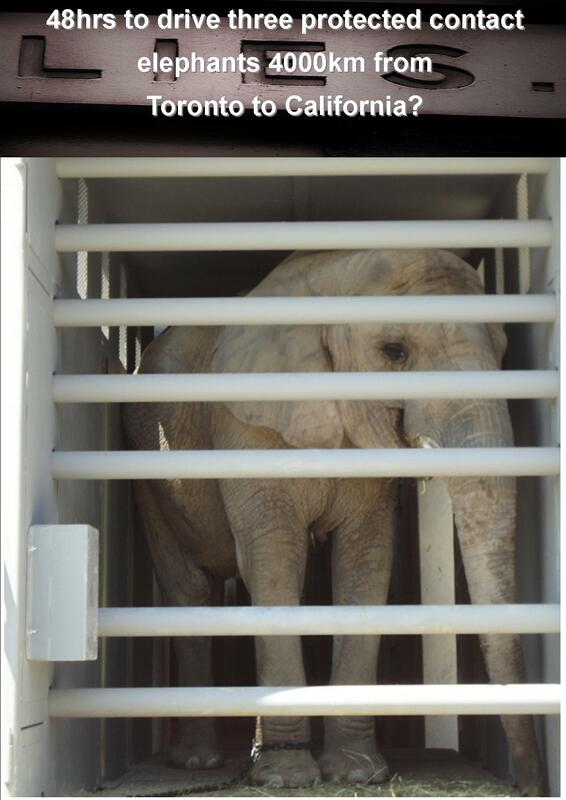 Contrary to what has been claimed AE is not the company which executed all of the logistics to transport the African elephant Maggie by plane to PAWS from Alaska, it was in fact the company which offered the commercial quote to transport the Toronto Zoo elephants by air. It just makes you go hmmmm? It would appear from the most recent City of Toronto FOIA that Zoocheck has convinced Bob Barker that the zoo staff will somehow attempt to disrupt the loading and transport process. Their job has been to train the elephants to enter their crates, they have done this. Active Environments are claimed to be expert elephant trainers and PAWS claims this too, surely now that the elephants have been trained by the award winning elephant management team at the Toronto Zoo PAWS and Active Environments can load them onto a couple of trucks? But as a result of more childish manipulation by Zoocheck Mr. Barker is hesitant to put the money up front for the costs of air transport despite making this promise in the media again and again. It seems Zoocheck’s constant private (in emails) and public media antics disparaging the zoo staff have likely planted this fear in his head and as a result the girls are now forced to be transported by road, it has nothing to do with our elephants being too big for transport by air. It has everything to do with money and deceit. City Council is willing to risk these elephant’s lives to save a few bucks or cater to animal rights ideology and it appears these so called animal welfare activists are willing to do the same. After being accused of having nefarious and selfish motives for two years now it seems that the only people who are truly concerned about the true welfare of these animals are the zoo staff and citizens who have fought this transfer from day one. Better off dead than captive bred? Seems this catch phrase for the anti zoo movement will hold true if we allow a horse transport company to transport 3 elephants, 44yrs, 43yrs and 32yrs non-stop over 4200km into the cold westerly climate and temperatures of the Rocky Mountains in the month of October only to face possible tuberculosis exposure. All in the name of animal welfare? Our source at a USA agency informs us that PAWS and Zoocheck are now currently lobbying USA government agencies with an application for a variance to waive the 28hr law so that they can drive with limited or no stops to California, 4200km. Rob Laidlaw has indicated in email correspondence that they will truck these elephants non-stop for what he claims is a 50 hour trip. It is likely to exceed 50hrs and that is not taking into consideration the unforeseen, that which you cannot predict. One only has to recall last summer’s tragic death during transport of three seals from an Ontario zoo, a move and a transfer which was initiated by and pushed by Zoocheck Canada. Two of the seals died within hours of the start of the move, one died later after it arrived at the St. Louis Zoo, Zoocheck of course blamed the transporter and the zoo. We feel this entire transfer is inhumane but the Toronto Zoo is a registered research facility in Ontario and therefore exempt from the Animal Welfare Laws which could challenge this as inhumane. However according to the Animal Welfare laws in Ontario this transport is inhumane. According to what WSPA Canada lobbies for on behalf of livestock in transport to slaughter it is inhumane. According to the 28Hr law in the United States it is inhumane and according to PETA if a circus transfers an animal for this length or time, chained and immobile it is inhumane. According to many animal welfare activists it is INHUMANE and according to The Ontario Society for the Prevention of Cruelty to Animals and the Animal Welfare Act they enforce it is inhumane. And finally according to the Federation of Canadian Humane Societies, exceeding the duration of recommended transport times by the Canadian Federation of Humane Societies qualifies as putting an animal in “distress” (here pg.13 subsection 64) and (here). In fact The Canadian Federation of Humane Societies does not recommend transportation longer than 52 hours for farm animals so the land transport plan of 50+ hours is in direct contravention of what is cited in the Federal Health of Animals Act. Because guess what? It is inhumane to transfer three disease-free animals (two ageing) 4200km cross country chained in a crate on a truck for 4.5 days to a facility with a known tuberculosis outbreak and risks in the herd they will be integrated into. It is inhuman because there is a closer, disease free facility willing to take these elephants. For $250k in cost savings to transport to Florida the City of Toronto will risk the lives of the Toronto Zoo elephants. And for those of you who are thinking why don’t you contact these organizations? We have. Not one has responded to our emails of concern over this inhumane and unethical transport and transfer. They support a transport plan which is considered less humane than what is legally allowable and ethically acceptable for animals being sent to slaughter? In a nutshell it is an animal welfare nightmare where ideology has taken precedence over the true welfare and well being of these three elephants. Facts, science and common sense are ignored and replaced by some kind of desperation to have these elephants at any cost, including risking their lives in transport or to tuberculosis. Councillor Raymond Cho at the November 27, 2012 council meeting said “Our elephants are so old anyway what difference does it make if they die from tuberculosis”, he honestly said this! Councillor Josh Matlow said “If the elephants could choose for themselves, don’t you think they would choose to take this risk?” He admits there is a risk and clearly council is willing to take that risk with these elephant’s lives in order to remain infallible and cater to their ideology or save a few bucks. You can view the archives of the meeting (here) and review the motions (here). Ironically if council had allowed the zoo to make the decision the elephants would be in Florida, they would have already been there for an entire year which would have saved the city over one million dollars. And more ironically animal rights groups claim zoos exploit animals for profit, greed and gain. In the case of the Toronto Zoo elephants the only people exploiting these elephants are the animal rights groups and their supporters, using Iringa, Toka and Thika as poster children for their campaigns, personal philosophies and a victory against zoos. As you can see it is a political nightmare where we have proof and evidence that PAWS is the wrong facility for these elephants and that their lives will be risked with such a long transport and then further risked due to tuberculosis risks in the African herd. Our elephants can contribute the future of wild elephants and aid in the improvement of captive elephant care in zoos in North America if they are a part of the new program at TNEC. TNEC will train zoos and zoo keepers how to use protected contact in order to phase of the use of elephant hooks, the Toronto Zoo elephants as training models from an award winning elephant management program at the Toronto Zoo would have aided in phasing out the elephant hook in all AZA facilities. Instead they will be tucked away at PAWS where only the well to do who can afford the $250 a day entrance fee will ever see them. At PAWS they will aid in raising money for PAWS and their affiliates like Born Free USA and In Defense of Animals to further campaign against zoos. Campaigning with millions of dollars salvation for the 450 elephants in captivity in North America which is about 1% of the total number of wild elephants which are slaughtered for their ivory every year. Did this all come down to no one wanting to or being able to put up the money up front to be reimbursed later by Mr. Barker? The promise and commitment to air transport was made and they cannot deliver, the promise there was no tuberculosis was made and it was untrue. This contract was signed under false pretences and broken promises. The CEO of the Toronto Zoo John Tracogna has the power to veto this contract and he chooses to pander to politicians and pay cheques instead of listening to the zoological professionals. This transfer has to be stopped. The 2nd strain of tuberculosis found in deceased Rebecca at PAWS is a new strain of TB not previously known to elephants, where did Rebecca get this strain? The people of this city do not know that Councillors Berardinetti and DeBaeremaeker literally lied to them about TB at PAWS. They also lied about staff, blaming them for this opposition and DeBaeremaeker in several incidences claimed that zoo staff were going to lose their jobs when this is entirely untrue. By zoosmatter in animals, Councillor Berardinetti, Councillor Carroll, Councillor Cho, Councillor DeBaeremaker, dead elephants, Glenn De Baeremaker, hypocrite, inhumane, PAWS, politics, sanctuary, statpak, toronto, toronto city council, toronto zoo, toronto zoo elephants, tuberculosis, Uncategorized, zoos on August 30, 2013 . The elephants made the trip to California just fine in spite of all the comments saying they would not and did it in 3 days, not the 4.5 predicted by you. So much for your expertise! Also, you would have much more credibility without the slander and scare tactics used to trash PAWS. I am against breeding facilities and separating family members so zoo visitors can gawk at an elephant in a cage. The use of bull hooks at breeding facilities is despicable. Apparently this practice is “going to be phased out” so you appear to think that makes it OK for the present! Bull hooks are used to punish elephants and to separate babies from their mothers to be shipped off to other zoos tearing families apart. Also, you have not included, in your very long diatribe, anything about all the elephants that died an early death at the Toronto zoo. Is that because it does not support your agenda? There is a good deal wrong with elephants in zoos and breeding facilities and you have not acknowledged this one iota. There is a great deal of information that does not agree with you. Why should the public believe anything you say? seems the public is beginning to believe what we are saying. So you approve of 84hrs of crate time and 70hrs of road time for the transport of animals? You are ok with this new precedent being set? You are aware that the affects of transport can take weeks to take affect? As per typical animal rights thinking you feel that trying to attack credibility or “hurt” someones feelings is some kind of valid argument. You see here is the thing, we dont care what people like you think. We feel you are zealots and extremists who cannot emotionally handle any challenge to your belief systems. You now support inhumane long distance transport of animals, so when a circus or a zoo or animals being sent to slaughter are shipped over 84hrs in crates, as long as they get fed watered and vet checks no matter what the final destination is you support this new standard? The destination does not justify the innate risks or the cruelty.Breeding of elephants in zoos was not a factor which affected the individual welfare of these three elephants furthermore they would not breed at National Elephant Centre, it is a moot point. Also the elephant hook at TNEC was to be used in calving only, not to beat a fetus out of an elephants uterous, you sound like a parrot citing off the ad campaigns of your organizational leaders. When a calf is born in captivity, yes it is not a natural environment relative to the wild and sometimes females freak out initially. The elephant hook is used to get the calf away for a short time and help to get it standing then it is reintroduced to its mother where bonding almost always takes place. I do not believe that with the decline of wild elephants and impending extinction cited in as little as 10 years we should stop breeding I think we need to find out how to make it work. I also believe that we should not be hiding elephants away in sanctuaries as folly for the rich or famous. Us lowly peons can just watch youtube or facebook? A real live elephant inspires stewardship whether you like it or not why else do you think people are willing to pay $250 a day to see them at PAWS? A long time ago in history people kept private menageries for the wealthy, PAWS is not evolution its de-evolution. It will be a global effort of regular citizens which save elephants not celebrities. PAWS had 6 deaths in 4 years, two of which were TB+ deaths one death, ruby an african elephant with a high risk history of TB exposure had a bronchial mass found on her lung at time of necropsy. They did not have it sent to the lab to culture for possible disease. Do you think that was responsible when they knew they were lobbying to bring the three disease free toronto elephants into that herd? Why dont you ask PAWS why they didnt have those cultures done? What reason would they have not to have them done? It was a simple matter of taking some tissues at time of death and sending it to lab for TB testing. They have lots of money it was not a matter of cost. Can you explain why they did this? Knowing that Rebecca died three months earlier from TB and exposed three other elephants. 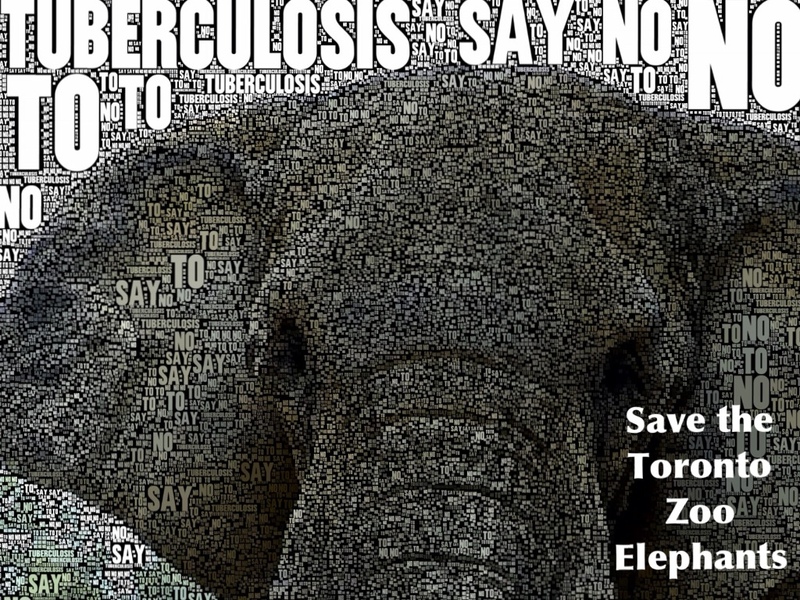 We might add that they told the Toronto Zoo and people of Toronto via the media that they had NO TB on site. Even though they full well Rebecca was TB+ when she died and transmitted the disease. Eventually Annie who had never had TB before became TB+ in June 2012, that is on site transmission. And you know what? They didnt even know Rebecca was TB+ until after she died. So they were not executing disease prevention protocols and they wore no protective gear or gloves. Shall I go on? I agree 100% with this article but I want to point out that I don’t think the trip to PAWS is “nonstop”. I have spoken to one of the truckers assigned to drive one of the elephants and he said they have scheduled stops every 4 hours or so at designated areas. Now whether the elephants can let out at any of these stops I don’t know. Originally they said they would drive non stop they did make stops but what will amount to 80 hrs in those crates is the most unethical act of cruelty. These organizations were willing to contravene their previous and current lobbies against this kind of transport as cruel so they could exploit these elephants as a victory against zoos. We feel it is disgusting and the greatest animal rights lies EVER! Great information! Thank you for the truth. I will be sharing. I hope those elephants survive the trip and then the TB. 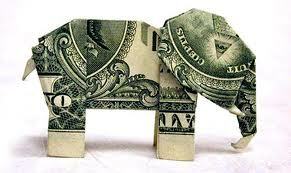 Elephants not liking winter is a ZooCheck Lobbyist MYTH to get your donations to line Animal Rights extremist pockets. Just Google Canadian elephants love snow and see the African Lion Safari elephants playing in Snow and making giant Snowballs by playfully rolling the snow with their trunks!!! (http://www.liveleak.com/view?i=d4a_1205388558 video was shown on CNN) Then go read about Limba the elephant in Bowmanville who loves going on winter walks with her keeper, Robert Crawford – who just won CAZA award = zoo professional of the year! On the We Love Limba facebook page, Robert (an elephant expert who has worked with wild elephants) makes some good points about keeping elephants in Canada. Did you know wild African elephants in the southern tip of Africa endure winters just like ours here? Did you know that in Asia, wild elephants climb mountains and live in higher altitudes where there is snow? The other animal rights funded Elephant sanctuary in Tenn. boasts about how the elephants like the snow. They leave them out in the cold. I guess elephants only like the snow and cold if they are at an animal rights funded facility. Thanks for this excellent explanation. In my opinion and experience, ZooCheck and the corrupt bunch of animal rights extremists only care about raising $$$ or getting re-elected, and NOT animal welfare. Case in point, Tale of two Story Books: 1) Story Book Gardens in London Ontario shut down and thanks to ZooCheck, two of the city of London’s cherished seals died while in transport to new homes in the USA. 2) Story Book Farm primate “sanctuary” = monkey jail where 24 monkeys kept in an old drafty barn under conditions that don’t even come remotely close to CAZA standards (that they claim to follow) and definitely violate ZooCheck and WSPA recommendations in all their reports on sanctuaries! ZooCheck’s Woodyear stood on the steps of the courthouse saying that Story Book Farm is the best place for Darwin the IKEA monkey! What about a reputable sanctuary like Bear Creek or Northwood in Ontario? How can ZooCheck support a place that houses baboons in 4 ft x 4 ft x 4ft mesh http://www.change.org/en-CA/petitions/zoocheck-canada-must-undertake-a-thorough-investigation-of-this-sanctuary-the-welfare-of-the-animals-at-story-book-farm-must-be-investigated-2 HEY ZOOCHECK, leave the well cared for and loved Toronto Zoo Elephants be! GO DO YOUR JOB and SAVE some NEGLECTED MONKEYS at Story Book Farm. So why does Rob Laidlaw continue to ignore this petition and the evidence that has been emailed to him including countless photos, videos? He wrote this new book about what makes a good sanctuary LOL Answer: $$$$ not animal welfare. Very well researched particularly given that the Toronto Zoo staff is indeed under a gag order. This move is being controlled by politics and politicians instead of the zoo staff that love and care for these elephants. Of course, this is a city with Rob Ford as the mayor so I guess its not surprising they have an animal rights idiot like Berardinetti as a councilor deliberately misleading the public and pushing her own misguided and misinformed ideologies. As a conservation biologist who works on endangered species, including elephants, I find this whole situation very disturbing. As a Canadian I find it embarrassing. As someone who has devoted her entire life to saving animals I find it demoralizing. Thank you for your support. Please feel free to email the Mayor and Zoo CEO and tell them how you feel. Thank-you for this well documented review of this horrendous situation. As a zoo volunteer I am outraged by the actions of those other than the professional experts; zoo staff. Our vets and keepers are the best in the world, with the welfare of the animals at the top of their priorities and do not deserve to be treated with such disregard. Praying for a positive outcome. environment-this is nothing but a propaganda last gasp attempt to again halt what should have been done three years ago-get with it Toronto and send the elephants to PAWS!!!! Enough of the BS!!!! It seems to me that you have just conveyed that your primary motive for supporting the transfer of our elephants to PAWS is to support yours and other’s campaigns and personal philosophies against zoos. 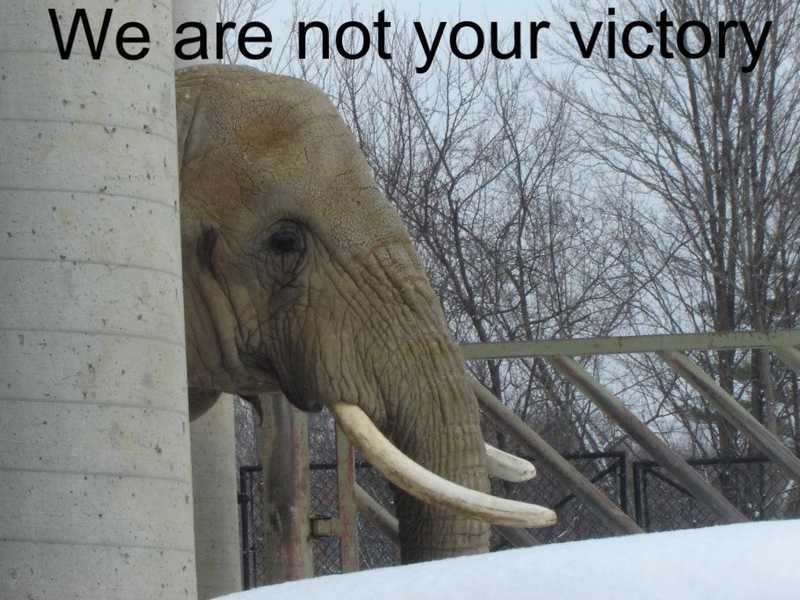 That our elephants are in fact poster children for you and a potential victory to support the anti-zoo movement. Am I correct? This would mean of course that their health and welfare are secondary in importance for you according to your exploitation of them to satisfy your need to have your point of view validated. Our primary motive is the health and welfare of these three individual elephants, not to support the AZA or CAZA or any facility which may keep animals in less than acceptable or inhumane standards. Your definition of inhumane is your opinion, which is shared by many of your narrow minded extremist affiliates who also wish to use the Toronto Zoo elephants to add momentum to your cause against zoos. You have hand selected a species for extinction IMO. You are moved by elephants but not necessarily by wombats or snakes. You take the pre-designed commentary handed to you by your movement’s leaders and you assail people with it ad nauseam without the benefit of real facts. You stomp your feet up and done without any sense of self awareness that you are behaving like a 10 year old child having a temper tantrum when faced with the reality that Santa Claus isn’t real; refusing to face the facts and ask questions of PAWS, like why they were not transparent and honest to you as their supporter would be a good start. Just avoid the truth to continue to feed your self serving need t be right. Or perhaps it is your inability to separate reality from your own emotional needs. At any rate you should at least be asking your spiritual leaders why after Rebecca’s TB only being discovered upon necropsy and STATPAK and trunk washes failed to diagnose her TB and exposure of 2 others they did not have the bronchial mass on Ruby’s lung they discovered at her necropsy cultured for disease when she died three months later. Clearly the history of failed diagnostics in the Asians just months earlier would have been a reasonable indication that her tissues should have been sent for culture so as to confirm there was no TB in the African herd. Considering Ruby shared the barn with the infected Asians for 2 years and previously had lived with an Asian elephant whose two former herdmates both died from TB you would think adding up all of those factors cultures would have been done. And why should they have been done, so that disease free elephants like the Toronto Zoo elephants would not be inadvertently exposed to disease, knowingly or otherwise. No one who claims to care about animal welfare should accept those cultures not being done and potentially putting animals health at risk. If you want to deny that question or avoid asking it that is your choice but we are asking that question and to date there has been no reasonable or logical explanation offered and one can only speculate that it was fear of documented disease in the African herd and subsequently the loss of opportunity to take in the Toronto Herd. Zoocheck is the organization with the propaganda problem and is an impediment to the conservation of this and other species by their clearly stated goal of shutting all zoos down. You complain about the conditions of these animals in captivity yet you obviously have no experience with the slaughter this and other species are faced with in their range countries. What is the color of the sky on your planet because it sure as heck isn’t the same planet I live on! The role zoos play in the conservation of wildlife species is irreplaceable through their work in public education, research and as safe havens from poaching and habitat destruction. And zoos will become even more critical to wildlife conservation in the future as human populations increase with the inevitable corresponding decrease of wild populations and habitat until humans evolve enough culturally to live sustainably with their local wildlife. We haven’t even mastered this skill in Canada and we are a rich, politically and economically stable country – unlike most of the range countries of elephants, tigers, rhinos etc. So WAKE UP! I know that my research collaborations with zoos and wildlife agencies has improved our ability to manage and conserve endangered species, both in captivity and the wild. What have you contributed to saving wildlife species from extinction? ABSOLUTELY NOTHING! You are accomplishing nothing but getting in the way of those of us, including the zoos, who are truly committed to conserving wildlife and have the expertise to do it. So you think it’s flat out lies? The reports of TB and the confinement of these animals in crates for 5 days is ok? How is it you care about the welfare of these animals? They should have gone to the sanctuary in Florida.